From the rhyme of The Ancient Mariner: “Water water everywhere, nor any drop to drink” is quite apt when you gaze over what appears to be acres of sparkling water in lush swimming pools languidly melding with the manicured garden apron out to the calm jade colored waters of Emerald Bay. But be assured there’s definitely plenty to drink and much more exciting than water. A tropical beach hideaway sitting in Phuket, the star of the Andaman Sea, Rosewood Phuket is a serene island escape, a wellness resort plus a bohemian’s playground. 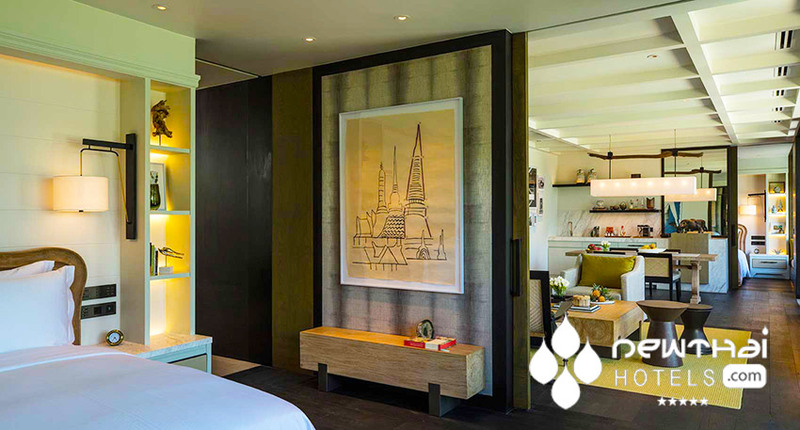 Nestled on a 600-meter beachfront, Rosewood Phuket is 1 of 2 properties under the Rosewood Hotels & Resorts brand that has recently opened, the other being in Phnom Penh, Cambodia. Costing more to build than any other Thailand resort to-date, the entire property has earned a gold LEED (Leadership in Energy and Environmental Design) rating. This is definitely a shining example of a green luxury hotel meeting the demand for sustainable travel options. From its 150-year-old sacred banyans to its innovative architecture with whispers of Thai influences, sun drenched shores to the discreet signage at the main entrance and meandering walkways that pass across the top of villas, it has been designed as a personal voyage of discovery. A boutique wonderland of escape and decadent luxury, there are only 71 pavilions and villas bathed in natural light from floor-to-ceiling windows that open onto your own private cocoon of lush tropical garden terraces complete with a personal infinity pool and outdoor seating area that includes the mandatory day bed for slothful afternoons. Timeless and elegant with sophisticated decor, the interiors immediately put you into soothing time-out mode with absolutely nothing to jar the senses out of this subliminal scene of beach-house opulence. The choice is yours from partial ocean pool pavilions to ocean view pool pavilions, total oceanfront pool pavilions of 1 and 2 bedrooms to ocean view and beachfront pool villas. You can even indulge in your own “Beach House’ or the “Ocean House”, each having 2 bedrooms if you need to accommodate the hordes in privacy. You never have to leave when it comes to meal times, unless you wish to go exploring the local restaurant scene of rustic restaurants where you can sit with your feet in the sand or join the throngs at one of the must-be-seen-at beach clubs decked out in your Armani best, as Rosewood Phuket offers numerous on-site options. You can pull up a chair and dine by the ocean at Ta Khai with a menu loaded with authentic and traditional Thai dishes created around what the local fishermen caught that day or head to the laid-back ambience of The Shack which sits by the pool. Its open kitchen with a hot stone oven and charcoal grill will have your mouth watering long before you sit down. If you have a hankering for some Italian fare, the Red Sauce restaurant is located on an outdoor terrace with stunning panoramic ocean views offering brilliant cuisine and an endless wine list. By day or by night “Mai Bar”, the chill-out lounge area, is the place to relax poolside. 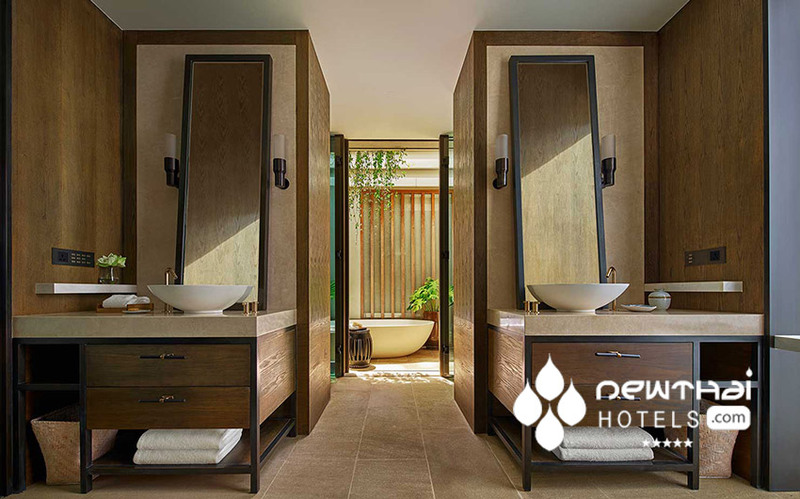 Rosewood Phuket’s holistic wellness concept, Asaya, subtly flows throughout the whole resort. You can slide into relaxation mode during a signature wellness treatment or an alternative therapy, maintain a somewhat grueling workout session or wallow in dreamy languor beside the pool. Rosewood Phuket is the perfect venue for meetings, special events or functions of any kind. You can even bring your family to this beach lover’s slice of heaven, as there is a children’s program to totally enthrall them, as much as you, with their absence. This entry was posted on Sunday, July 1st, 2018 at 1:13 pm and is filed under Openings. You can follow any responses to this entry through the RSS 2.0 feed. You can leave a response, or trackback from your own site.